New technology, training and education are ways in which development can better our lives. Yet, we are also compelled to question what so-called development is costing us, especially when policy makers and those in the government trample upon the rights and feelings of the people in the name of development. Manipur is a small dot on the global map, but such things happen here too. 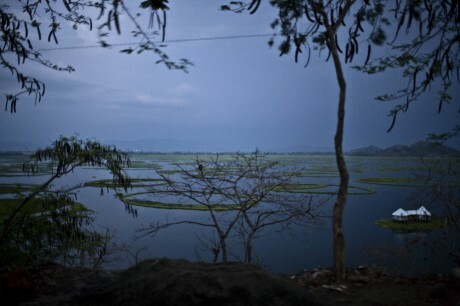 Loktak Lake which is the largest freshwater lake in northeastern India and it is dying as a result of a hydro-electric project. Thousands of people who traditionally depend on the lake and its resources for their livelihoods are left to the mercy of the policymakers. Despite public protests, the government is planning to build mega-dams, evicting people from their houses and acquiring their paddy fields for airport expansion, and government housing and offices. Another example is the recent eviction of women street vendors from the Nupi Keithel (literally, “women’s market”) the biggest market in Manipur, located in the heart of Imphal, the capital. All markets in Manipur are run by women. From very early days in Manipuri history, the Nupi Keithel has been a symbol of the courage, societal contribution and familial burden and responsibility of our women. There are many examples in our history when the women vendors of these markets successfully fought for social change. Citing traffic jams, urban beautification and the need to create car parking blocks, the state government decided to pull down the old market sheds and build two-storied complexes on the same spot. The complexes were inaugurated recently. The licensed women vendors who used to sell their wares in the old market sheds were allowed back into the new buildings. However, around 4,000 unlicensed women street vendors who used to sell vegetables, fish and other foodstuffs on the streets around the newly built complexes were not allotted space inside the new market complexes. Instead they were asked to move out of the market area and sell their wares at a derelict supermarket complex around a kilometer from Nupi Keithel. There are no toilets, no market sheds or any other facilities here, only vast open space. When the women street vendors protested, they were tear-gassed, beaten and 27 of them were sent to jail. In Manipur, when all else fails, it is the keithel (market) which sustains a woman and her family. Most of the women vendors are widows, many of them living way below the poverty line. Yet it is these same women who take up the economic responsibility in their family – feeding and educating their children, and sometimes, many of them even support their ailing or alcoholic husbands too. The state government should be focusing on why more and more women are coming out to sell vegetables at the market, how corruption and nepotism is resulting in the total failure of most government schemes including the public distribution system (PDS). Instead they want to clean up Imphal at the expense of the genuine needs of these women, some of whom have been sitting on the street corners selling their wares for more than 30 years. We have taken this matter up with the Manipur State Women Commission, a statutory body set up by the state government under the National Commission for Women Act, 1990. Now we are interviewing the street vendors and collecting related documents from the government departments. Based on the final report, we are thinking of filing a public interest litigation (PIL) about the matter.